It’s that time of year again. The time when the glitz and glamor of the holidays has finally subsided. No longer do we crave chestnuts roasting on an open fire, or dream of a fat elf wiggling down our collective chimneys. Gone are the heartwarming thoughts of snow covered pine trees, or being bundled up to watch New Years Eve fireworks. The doldrums of Old Man Winter’s season has finally arrived. The cold weather that bites at us on an almost daily basis (this is the south, after all) is now more an annoyance, than something to be looked at with reverie. We have no purpose for this cold now, no Thanksgiving to look forward to. No Christmastime cheer to lighten our hearts when facing temperatures that plummet. No reason to be bundled up all “cozy and warm” with good cheer to spend toward our fellow man. But, we do have one thing. We’re ready to go to the BEACH! Well, everything but that last part. I personally can’t stand some of the food found on the southern coastline. Mostly because the vast majority of the seafood in your “Admiral’s Basket” was “fresh caught from the freezer section THIS VERY MORNING!” Not to mention the cocktail sauce came in a five gallon bucket from Kraft Foods! I prefer my seafood boiled. More specifically, I like Low-Country Boils (as if you already haven’t figured that out, by now). The perfect one-pot-wonder that is as versatile as it is easy to prepare. Make it outdoors with a giant pot and a propane fish cooker, or make it indoors in a boiler with a stove top. Feed 5 or 50 make it mild, medium, hot, nuclear, melt-my-face-off or whatever suits you. 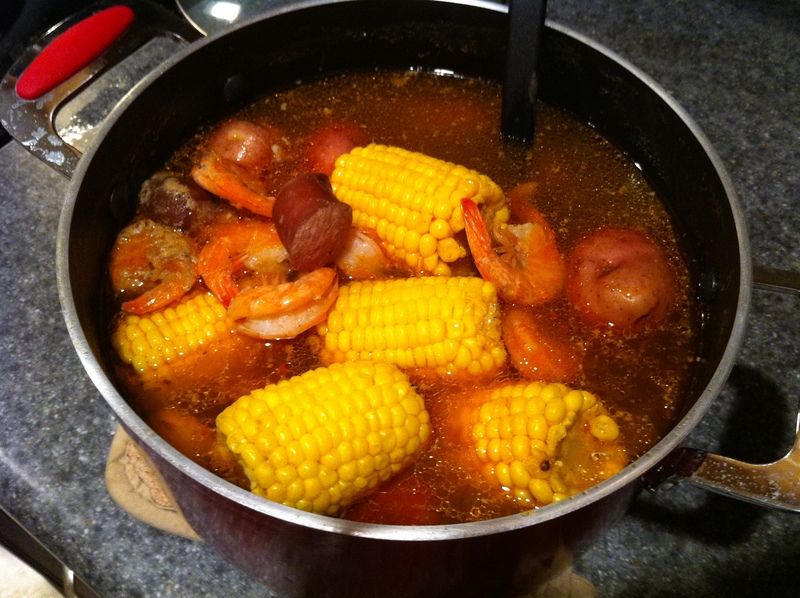 *The traditional recipe calls for The pre-boil ingredients, potatoes, corn, sausage and shrimp. Please note that ingredients for this dish are not based on certain amounts. However they are based on how much you and your guests can eat. 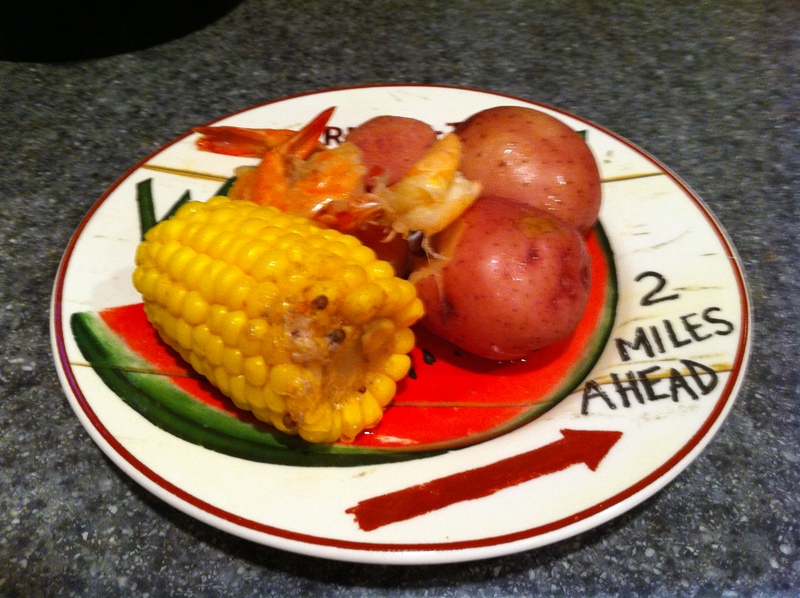 I usually account for two potatoes, one piece of corn, one piece of sausage, and 1/4 pound of shrimp per serving. The following table represents ingredient ideas as well as approximate cooking times. Stage 1 Red Potatoes (Of similar size) Add to boiling water. Return to boil, and cook for 20 minutes (small potatoes) or 30 minutes (larger potatoes), or until potatoes are almost fork tender. Whole Garlic Cloves (peeled) Add to boiling water. Return to boil, and cook for 10 minutes. All said, you want your boil to cook for between 35 & 45 minutes based on the thickness of your potatoes, and the stage three items you want to add. (Planning ahead, and doing a little cooking time math sheet will go a long way in having a successful boil. One the boil is over, allow the items to cool in the pot for at least 10 minutes. This is called “resting” and allows the stage three items a chance to absorb some of the seasonings that are floating on the top of your boil water. This is also the time to have a side pot ready for those who would like spicier seafood. To make a side pot, pre-boil a mix of liquid and dry crab boil in a smaller side pot, and use double the standard proportions (or more if you know what you’re doing.) Then, once the boil is finished, transfer the seafood that needs to be spicier to this pot, and allow it to rest in it. The heat will ramp up significantly, based on the amount of seasoning you use. The Finished "Stove Top Boil"
As a final note, The traditional way to serve (when outdoors) is to drain the pot, spread out old newspapers on a table, and dump the whole lot in the middle. However, I find that straining ladles, and paper plates work just fine. Just, omit the plastic ware. You are supposed to be on the beach, remember? Just eat with your hands, and dream of July.